The U.S. Department of Justice recently settled several claims filed against employers across the country alleging they discriminated against non-citizens by requiring them to produce a document issued by the Department of Homeland Security proving their right to work in the United States. It is important for employers to know what documents they may ask for during routine I-9 requests. The Justice Department issued several recent press releases (here, here, here, and here) indicating it had reached a settlement with a number of companies over allegations the company violated the Immigration and Nationality Act (INA) by unlawfully requesting specific work authorization documents from non-U.S. citizens based on their citizenship status. In one case, an investigation was initiated after a lawful permanent resident contacted the Department and alleged that Walmart fired her on her first day of work because she could not provide a document issued by the Department of Homeland Security (DHS), in conjunction with the company’s I-9 compliance. The employee then complained to Wal-Mart and a regional supervisor and hiring staff member at another nearby store incorrectly reaffirmed the unnecessary request for a DHS-issued document. According to the Department, their investigation concluded that the human resources employee had a practice of requesting unnecessary DHS documents from non-U.S. citizens to establish their work authorization because of their citizenship status. The INA prohibits employers from (a) rejecting valid work authorization documents, (b) limiting workers’ choice of documentation to present for employment verification, and (c) subjecting workers to different or unnecessary documentary demands, based on the workers’ citizenship, immigration status, or national origin. The Immigrant and Employee Rights Section (IER), formerly known as the Office of Special Counsel for Immigration-Related Unfair Employment Practices, is responsible for enforcing the anti-discrimination provision of the INA. Among other things, the statute prohibits citizenship status and national origin discrimination in hiring, firing, or recruitment or referral for a fee; unfair documentary practices; and retaliation and intimidation. Applicants or employees who believe they were subjected to different documentary requirements based on their citizenship/immigration status or national origin, or discrimination based on their citizenship/immigration status, or national origin in hiring, firing, or recruitment or referral for a fee, are encouraged to contact IER’s worker hotline for assistance. 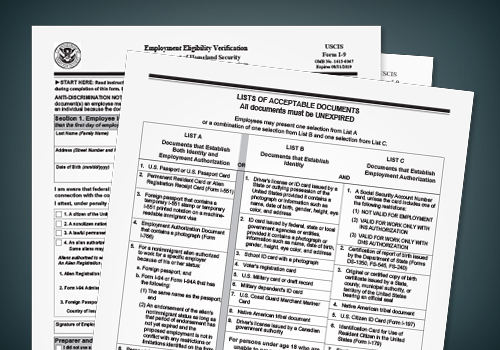 The final page for Form I-9 contains a list of documents that employers must accept to establish identity and authorization to work. Employees may present one selection from List A or a combination of one selection from List B and one selection from List C. Employers do not have any discretion to specify or require certain documents from the list; however, they must ensure that any documents provided are unexpired. Employers are responsible for completing Section 2 of the Form I-9, which includes verifying that they physically examined the proffered documents. Employers should take care not to treat non-citizens differently than citizens during routine I-9 compliance. Compliance with I-9 requirements is not complicated, and acceptable documents are clearly noted on the last page of the form. Employers should not deviate from these requirements.